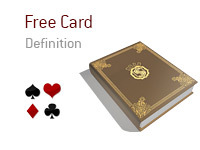 What does the term "free card" mean in poker? What is the definition of the term "free card"? In poker, a "free card" is when you are drawing in a hand and don't have to call another bet to see another card. Action folds around to the button who puts in a standard pre-flop raise. The SB folds. You look down at 8s-9s and call. The flop comes As-Js-4h. You have a flush draw. You check, as does your opponent. By not betting, your opponent has given you a "free card" with which to hit your flush. If your opponent had bet, you would have had to have put more money into the pot to chase your flush. You are dealt pocket Aces in early position. You put in a raise. Action folds around to the button, who calls. The SB and BB both fold. The flop comes 3h-4h-Ks. You check, as does your opponent. The turn brings the 6h. You lead out with a bet and your opponent raises you. You gave your opponent a "free card" by not betting out after the flop, and now they may very well have hit a flush or straight. Now what do you do? By not betting out after the flop, you don't have any idea of where you stand in the hand. Does your opponent have a flush? A straight? A pair of Kings? Is he bluffing altogether? This is the danger of giving your opponent a "free card".